Day 1733 Day 2818 g.e. 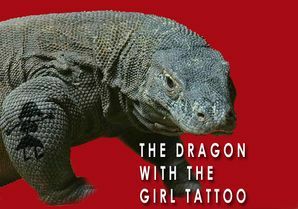 The Dragon with a Girl Tattoo (Draconis puella tattoous) is a monster. The youngest of a particularly conservative family of Grayscaled Dragons, this young dragon grew up in a conservative atmosphere. It went to a private school and graduated a valedictorian in the Fine Arts of Hero Roasting School. It unfortunately had a little too much to drink at its graduation party. Long story short, it woke up in the middle of Las Vegas with a tattoo of a very thin gothic girl in a rather unfortunate place. Its family disowned it, cutting it off from a inheritance that was quite large. Now this monster from a Greek tragedy wanders around trying to gather funds for tattoo removal, applying its skills of Hero Roasting and offering snooty jabs at the Hero's improperly tied Windsor Knot and absolute lack of table manners ("Just lie still when being roasted goshdarnit!"). Killing this monster might give the Hero an opportunity to pillage the minor fortune it carries around in its holiday briefcase. Its knowledge of the perfect way to roast a Hero for maximum succulence. Its snide comments might severely damage the Hero's sense of self esteem. Mentioning its family can make it literally tear itself up into pieces. Telling it that your college was better than its college will result in a lengthy discourse which can be used as a distraction to sneak away. Telling it that it is hired will cause it to quickly comb its hair, stand up and say "thank you sir" before nervously flying away.